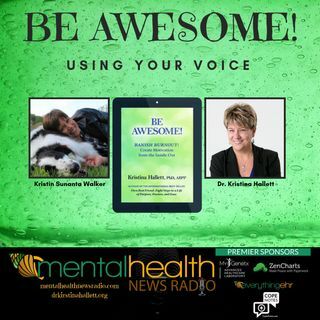 Join us for the third show in our series on Mental Health News Radio: Be Awesome with Dr. Kristina Hallett! Join Dr. Hallett and Kristin Walker as they talk about what it means to use your voice. We also talk about healthy boundaries - how to set them, keep them, and realize they are part of your self-care. Dr. Hallett is a board certified specialist in clinical psychology and a Fellow of the American Academy of Clinical Psychology. Dr. Hallett has over 25 years of experience providing ... See More psychotherapy, consultation, and supervision to medical and mental health professionals in addressing relationship and major life issues – depression, anxiety, substance abuse, parenting, divorce, and other life challenges. Dr. Hallett is a certified divorce mediator and a nationally certified parenting coordinator. In addition to psychotherapy, Dr. Hallett provides Executive Coaching - the fast track to leadership, confidence and work-life synergy. Her specialty is assisting driven professionals and entrepreneurs to become stress-smart by harnessing the positive power of stress to increase resilience, productivity, and well-being. She is the author of the international best-sellers Own Best Friend: Eight Steps to a Life of Purpose, Passion, and Ease and BE AWESOME! Banish Burnout: Create Motivation from the Inside Out. She received her Ph.D. in Clinical Psychology from the University of Massachusetts at Amherst. She has been the Director of the Brightside Counseling Associates, Director of Children’s Services at Providence Behavioral Health Hospital, Director of Mental Health Services at Osborn Correctional Institution and Director of Internship Training for the Connecticut Department of Mental Health and Addiction Services at River Valley Services. Dr. Hallett is currently an Associate Professor in Graduate Psychology and Director of Clinical Training at Bay Path University. If you are ready to banish burnout, learn the skills to value who you really are and to truly be your #ownbestfriend (with all the awesome, rockstar benefits), get in touch. Your future is waiting!